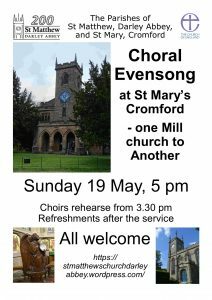 Come and join us for Choral Evensong on Sunday May 19th at 5.00 pm. incorporating the Parishes of St Matthew, Darley Abbey and St Mary’s Cromford. This is a celebration of one Mill to church to another. Rehearsals start 3.30 and the service commences at 5.00 pm. This event promises to be a celebration of Sung Evensong and all are welcome with refreshments after the service.